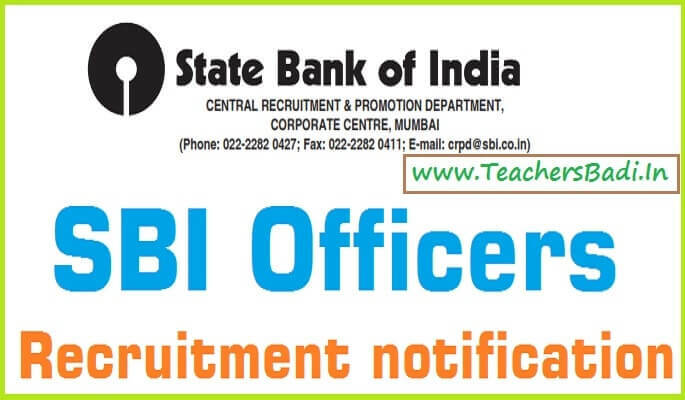 SBI Officers recruitment notification: State Bank of India has published the Officers recruitment notification and SBI invites Online applications from Indian citizens for appointment in following Positions in Specialist Cadre on contract basis in State Bank of India. SBI Officers recruitment notification in Specialist cadre, Online application form, last date for apply, Registration fee, How to apply details given here. ADVERTISEMENT NO. CRPD/SCO-WM/2016-17/21: State Bank of India invites Online applications from Indian citizens for appointment in following Positions in Specialist Cadre for wealth management in State Bank of India on contract basis. Candidates are requested to apply Online through link given in “careers with us” section of Bank's website www.statebankofindia.com or www.sbi.co.in. State Bank of India invites Online applications for the posts of Officers in Specialised Positions for wealth management on contract basis. Qualification: MBA/ PGDM/ Graduation/ PG/ PG with AMFI/ NISM with relevant experience.